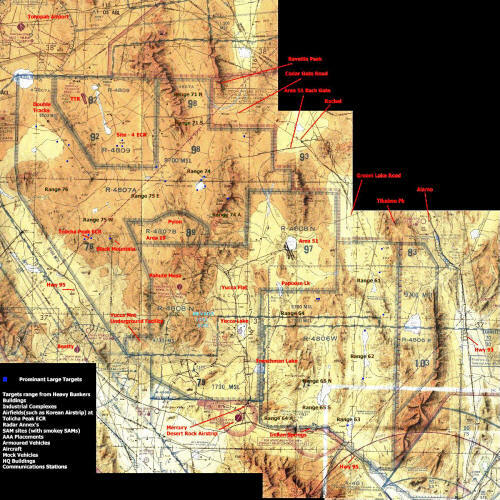 Green Flag is centered more on the Site 4 and Tolicha Peak Ranges administered by Tonopah Test Range. The ranges around these areas have high threat facilities with Russian Equipment such as SA6, SA3 SAMs, ZSU-23-4 AAA Vehicles and various Early Warning Radar Systems. The SAMs on all the ranges are simulated by an actual rocket that is fired up towards the aircraft with a huge flare and lots of smoke. These are called appropriately 'Smokey SAMs' and are as real as you can get without actually being fired at by a real SAM threat. On the ground during the exercises there are many military targets live and dumb. These are also in the MOAs on public BLM Land, especially around the Rachel and Cedar Gate Areas. These range from Mobile SAM units, Mobile AAA and also convoys of trucks moving or parked.